(PhysOrg.com) -- Members of the international STAR collaboration at the Relativistic Heavy Ion Collider -- a particle accelerator used to recreate and study conditions of the early universe at the U.S. Department of Energy's Brookhaven National Laboratory -- have detected the antimatter partner of the helium nucleus: antihelium-4. This new particle, also known as the anti-alpha, is the heaviest antinucleus ever detected, topping a discovery announced by the same collaboration just last year. The new record will likely stand far longer, the scientists say, because the next weightier antimatter nucleus that does not undergo radioactive decay is predicted to be a million times more rare - and out of reach of today's technology. "This discovery highlights the extraordinary capabilities of RHIC to investigate fundamental questions about the nature of matter, antimatter, and the early universe," said William F. Brinkman, Director of the DOE Office of Science. Steven Vigdor, Brookhaven's Associate Lab Director for Nuclear and Particle Physics, who leads the RHIC program, said, "Barring a new breakthrough in accelerator technology, or the discovery of a completely new production mechanism, it is likely that antihelium-4 will remain the heaviest stable antimatter nucleus observed for the foreseeable future." The STAR physicists describe the discovery in a paper in Nature, published online April 24, 2011. The ability to create and study antimatter in conditions similar to those of the early universe is no small matter: One of the great mysteries of physics is why our universe appears to be made entirely of ordinary matter when matter and antimatter are understood to have been created in equal amounts at the time of the Big Bang. At RHIC, head-on collisions of gold ions moving at nearly the speed of light simulate conditions just after the Big Bang. In these atomic smashups, quarks and antiquarks likewise emerge with approximately equal abundance. A major fraction of the stable antimatter produced in RHIC collisions leaves a clear signal in the STAR detector before annihilating with ordinary matter in the outer part of the experimental apparatus. By sifting through data for half a trillion charged particles emitted from almost one billion collisions, the STAR collaboration has detected 18 examples of the unique "signature" of the antihelium-4 nucleus. Consisting of two antiprotons and two antineutrons in a stable bound state that does not undergo radioactive decay, the antihelium-4 nucleus has a negative electric charge that is twice that of an electron, while its mass is very close to four times that of a proton. Data plots show that the newly discovered anti-alphas are very cleanly separated from the lighter isotopes, and are at the expected mass. 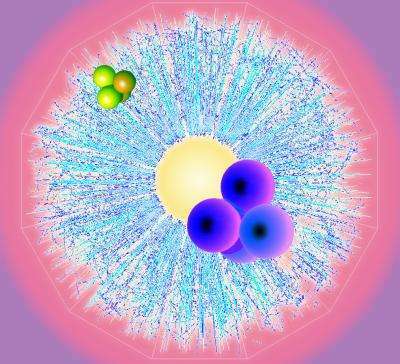 The scientists also measured the antihelium-4 production rate in nuclear interactions, and found that it is consistent with expectations based on a statistical coalescence of antiquarks from the soup of quarks and antiquarks generated in RHIC collisions. But the fact that 12 antiquarks combine to build such a complex antinucleus in a way that bears out these predictions is really quite remarkable considering it all takes place in the midst of rapidly expanding matter created at trillions of degrees and surviving for only ten trillionths of a trillionth of a second. Knowing the production rate of these antinuclei is important to a wide range of scientific disciplines, including searches for new phenomena in the cosmos. For example, it ties in with the scientific goals of an experiment known as the Alpha Magnetic Spectrometer (AMS), which will be delivered to the International Space Station via one of the last space shuttle missions, currently scheduled for launch in late April 2011. This experiment will search for antimatter in space. "If AMS were to find evidence for the existence of bulk antimatter elsewhere in the cosmos, the new measurement from the STAR experiment would provide the quantitative background rate for comparison," said Hank Crawford, a STAR collaborator from the University of California, Berkeley, Space Sciences Laboratory. "An observation of antihelium-4 by the AMS experiment could indicate the existence of large quantities of antimatter somehow segregated from the matter in our universe," he said. In 2010, the Large Hadron Collider at CERN, the European laboratory for nuclear and particle physics research, began its own collisions of heavy nuclei at energies more than an order of magnitude higher than at RHIC. Experiments there also have the capability to study production of antinuclei, and it will be interesting to see what those experiments find at higher energies. "The discovery of the antihelium-4 nucleus also has special synergy with a major scientific anniversary: the 100th anniversary of Ernest Rutherford's seminal gold foil experiments, in which he used ordinary-matter helium-4 (alpha) particles to probe the structure of matter," said Brookhaven physicist Aihong Tang, a member of the STAR collaboration and a lead author on the Nature paper. "These experiments, conducted in 1911, established the very existence of atomic nuclei for the first time, and marked the dawn of our modern understanding of atoms." High-energy nuclear collisions create an energy density similar to that of the Universe microseconds after the Big Bang; in both cases, matter and antimatter are formed with comparable abundance. However, the relatively short-lived expansion in nuclear collisions allows antimatter to decouple quickly from matter, and avoid annihilation. 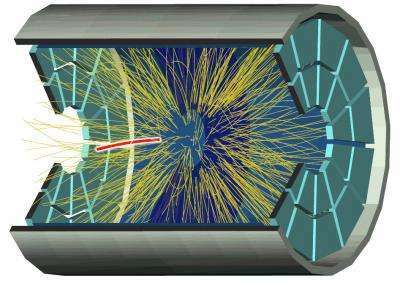 Thus, a high-energy accelerator of heavy nuclei provides an efficient means of producing and studying antimatter. The antimatter helium-4 nucleus, also known as the anti-α, consists of two antiprotons and two antineutrons (baryon number B = −4). It has not been observed previously, although the α-particle was identified a century ago by Rutherford and is present in cosmic radiation at the ten per cent level. Antimatter nuclei with B < −1 have been observed only as rare products of interactions at particle accelerators, where the rate of antinucleus production in high-energy collisions decreases by a factor of about 1,000 with each additional antinucleon. Here we report the observation of the antimatter helium-4 nucleus, the heaviest observed antinucleus to date. In total, 18 antimatter helium-4 nucleus counts were detected at the STAR experiment at the Relativistic Heavy Ion Collider (RHIC; ref. 6) in 109 recorded gold-on-gold (Au+Au) collisions at centre-of-mass energies of 200 GeV and 62 GeV per nucleonnucleon pair. The yield is consistent with expectations from thermodynamic7 and coalescent nucleosynthesis8 models, providing an indication of the production rate of even heavier antimatter nuclei and a benchmark for possible future observations of the antimatter helium-4 nucleus in cosmic radiation. But the fact that 12 antiquarks combine to build such a complex antinucleus in a way that bears out these predictions is really quite remarkable considering it all takes place in the midst of rapidly expanding matter created at trillions of degrees and surviving for only ten trillionths of a trillionth of a second. From the quarks "perspective" it's a longer time, no? 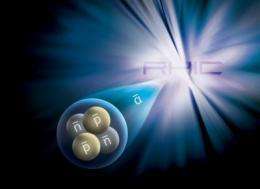 Consisting of two antiprotons and two antineutrons in a stable bound state that does not undergo radioactive decay...[snip] ...and surviving for only ten trillionths of a trillionth of a second. I keep stumbling over that phrase "stable bound state", which is kind of funny seeing how there are unproven assumptions stated as facts in almost every paragraph of this article. How many probabalistic orbits do the positrons have to make it "around" before the grouping is considered to "exist"? Less than one? "An observation of antihelium-4 by the AMS experiment could indicate the existence of large quantities of antimatter somehow segregated from the matter in our universe," he said. I fully agree with you. I hate seeing all the advertising in the comment section. As to these obtrusive ads, I've set my filter at 2.5... No spam! How can your editors allow blatant spam like in this piece? Are you powerless to stop it? How can you allow a science magazine to have free advertising like this? Or is it free? Have you in fact made a little backroom deal to wink wink this stuff? That spam is hostile. Some users are systematically reporting every spam incident and some time later it is all gone. On my system I have trusted users appointed to deal with the same problem. They take a heavy load of my back. When they log in there is an extra button on their interface "Remove as spam". The articles they remove are stored in a separate MySQL database to safeguard against misuse. The site admin(s) of physorg.com could do the same. I'm pretty sure this is old news, I believe physorg had an article on this several weeks ago. Either that or the results from RHIC hadn't been confirmed then. surviving for only ten trillionths of a trillionth of a second. That's not a typo right? Ten trillionths of a second is brief enough! I think someone should edit that as 10^9 or 10E9.